A typical Menuha Formation outcrop south of the Makhtesh Ramon structure. Editor’s note: Senior Independent Study (I.S.) is a year-long program at The College of Wooster in which each student completes a research project and thesis with a faculty mentor. We particularly enjoy I.S. in the Geology Department because there are so many cool things to do for both the faculty advisor and the student. We are now posting abstracts of each study as they become available. The following was written by Andrew Retzler, a senior geology major from Wooster, Ohio. Here is a link to Andrew’s final PowerPoint presentation on this project as a movie file (which can be paused at any point). You can see earlier blog posts from his field work by clicking the Israel tag to the right. Andrew also created a Wikipedia page on the Menuha Formation. It all began with an 11-hour flight from NYC to Tel Aviv, Israel with Dr. Wilson and fellow geology senior Micah Risacher. The airport process required for international travel of this sort was an adventure in itself. Thorough baggage checks, stern looks from security personnel, and a bombardment of questions dealing with our reasons for travelling were all offset by a seemingly endless and free movie selection on the flight! Eventually, we reached our arid destination of Mitzpe Ramon, the city that would serve as our basecamp for the next two weeks. One of the reasons behind our trip was to scour the Menuha Formation outcrops throughout the Makhtesh Ramon region (shown above). We were hoping to collect and analyze various fossils in order to reconstruct an environment that once flourished during the Cretaceous. This process also involved taking detailed measurements and notes on each outcrop to create stratigraphic columns of each locality. This would become the basis of my thesis. Of course, none of this could have been possible without the help of our all-knowing field guide, Yoav Avni, and our shark specialist, Stuart Chubb, from the Birkbeck College of London. Although my thesis has a strong focus on the shark and other fish teeth collected from the Menuha Formation, it also incorporates oysters, trace fossils, and several benthic/planktic foraminiferans. 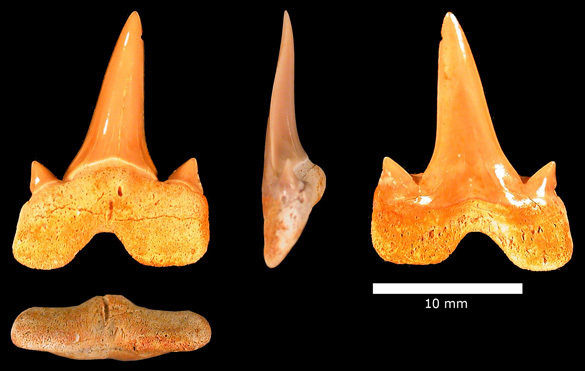 At least ten different species were represented in the isolated teeth: Cretalamna appendiculata, Cretoxyrhina mantelli, Squalicorax falcatus?, Squalicorax kaupi, Scapanorhynchus rapax, Scapanorhynchus raphiodon?, Carcharias samhammeri, Carcharias holmdelensis, and two other fish (Hadrodus priscus and Micropycnodon kansasensis?). Many of these fish were thought to occupy outer shallow marine realms, where the continental shelf begins transitioning into the slope. A few of the sharks are also known for being top Cretaceous predators, four or more meters in length, whose diets included plesiosaurs, mosasaurs, and ichthyodectids. 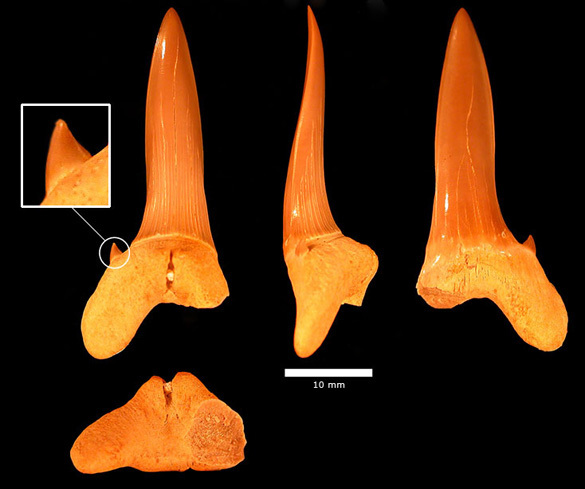 Cretalamna appendiculata tooth, a shark often considered to be an ecological generalist. Scapanorhynchus rapax tooth. Related to the extant Goblin Shark, S. rapax had the ability to protrude its mouth in order to capture prey. Cretoxyrhina mantelli tooth. Considered a superpredator of the Cretaceous seas, this shark could reach 5-6 meters in size. Squalicorax kaupi tooth. 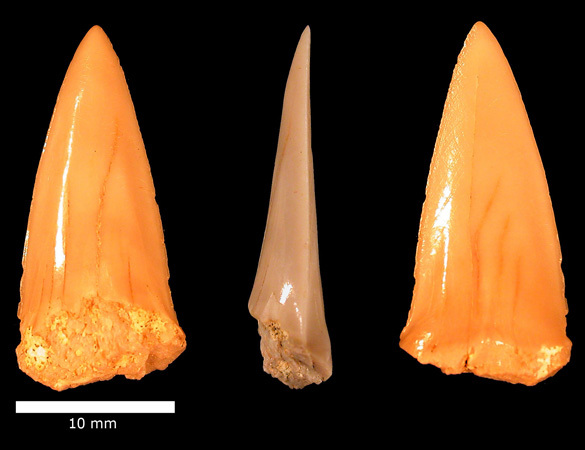 The Squalicorax genus is the only group to exhibit serrated dentition, like so, in the Late Cretaceous. Hadrodus priscus pharyngeal teeth. These teeth would have been found near the back of the throat arranged in a comb-like structure to help crush exoskeletons. LEFT: The extended left valve of a Pycnodonte vesicularis. 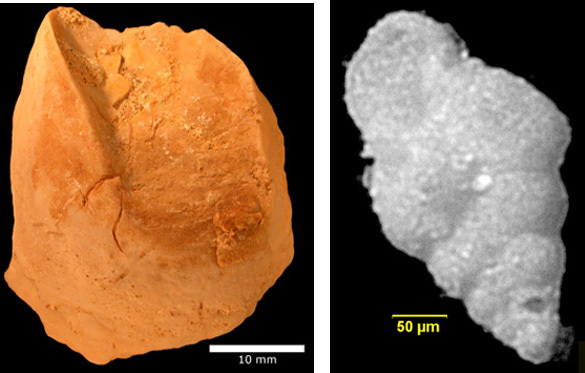 RIGHT: Planktic, biserial foraminiferan test (possibly Heterohelix sp.) that has been replaced by silica. The Menuha Formation consists mainly of white and yellow/brown, glauconitic chalks that were often marly or conglomeratic. This chalk comprised a variety of phosphatic peloids, microteeth, irregular echinoid spines, and benthic/planktic foraminiferans that clearly represent a shallow marine environment. Irregular echinoid spine recovered from the partially dissolved Menuha chalk. Microtooth from the Menuha chalk. Correlating the paleontology with their lithological context, a shallow marine outer continental shelf/middle continental slope environment is suggested as the paleoenvironment of the Menuha Formation. This environment would have also flourished with a variety of small to medium-sized fish, squid, and larger vertebrates (plesiosaurs and mosasaurs) in order to sustain such a shark population. Unlike the deep environment that has often been suggested, my thesis provides strong evidence towards a shallow marine environment during the early formation of the Makhtesh Ramon structure. 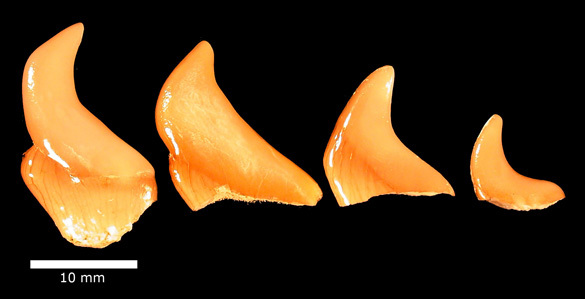 My work also marks the first identification of the fish teeth within the Menuha Formation, beginning my contributions to the scientific world. This is the greatest thing I’ve ever seen anyone do ever!